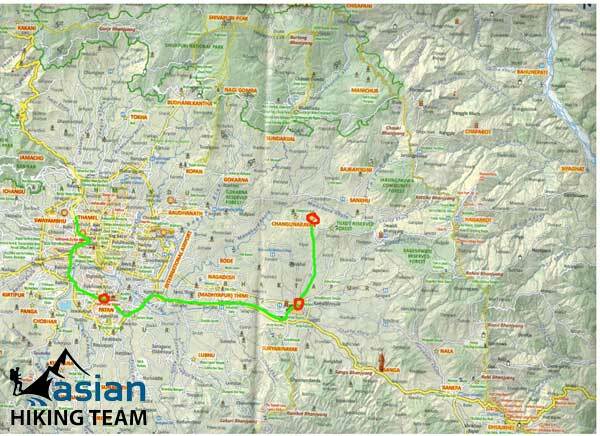 Chisapani to Dhulikhel cycling trip is very famous route and many enthuses are looking the short and the best cycling trip. Chisapani Dhulikhel cycling is design all of rider, because it is not vertical climb. Chisapani mean “cold water” is one day hiking trip from Kathmandu but we will bring you to this point follow the seasonal road. Chisapani cycling can see the hidden valley and the snow peaks. Nagarkot hill is the best tourist destination in Nepal for those who have not time and not possible to go near the snowy peak. We can explore the mountain panoramic view from west to east of Nepal. Many travelers stay is Nagarkot for sunrise / sunset view Mt. Everest also can see in the Far East part if the weather is clear. Dhulikhel is also one of the best tourist spots of Nepal. The uncountable view, the scenery valley, tropical Newari culture is the recommend to our clients to visit in Dhulikhal. Navo Buddha, Panauti, Khopasi is our destination on the last day of our cycling trip. Highlight of Trip: The picture quest of Chisapani, Nagarkot, Dhulikhel / view of Mt Everest / Newari Culture / hidden valley view. Short itinerary of trip: Kathmandu – Chisapani – Nagarkot –Dhudikhel - Kathmandu. Day 01: Biking from Kathmandu to Chisapani 4/5 hours. Day 02: Biking from Chisapani to Nagarkot 4/5 hours. Day 03: Biking from Nagarkot to Dhulikhel and Kathmandu 5/6 hours. Mountain bike, equipments, repairing parts. Professional equipped English speaking Cycling Guide (Language can request). Insurance, meals, accommodation for Tour Guide and their daily wages. Meals and Accommodation during your stay in Kathmandu. Tips for cycling Guide after the trip. Notes: Payment should be made 25 % of total amount in advance. Full amount must be paidbefore your trip starts. Start our cycling trip after breakfast, till to Gokarna flat then climb and is following the seasonal road till to Chisapani 2150m 4 hours. Overnight in Hotel. Day 02: Biking from Chisapani to Nagarkot 5 hours. After hot breakfast we star our cycling trip following one hour same way then down to catch Patibhanjang and gragually climb to Nagarkot 2175m 5 hours, overnight in Hotel. Day 03: Biking from Nagarkot to Dhulikhel and continues to Navo Buddha & return to Kathmandu 2 hours. Get up early morning for sunrise view and start our cycling on the way to Tower and ride down to catch the local path, crossing the local house and to reach in Dhulikhel 3 hours after lunch, we will visit Navo Buddha 1 hour and return to Kathmandu 2 hours.